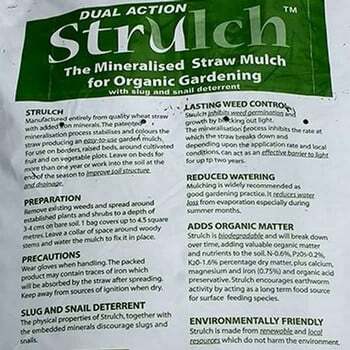 Strulch Dual Action Garden Mulch is a mineralised wheat straw garden mulch which reduces weed growth by up to 95%, enriches soil, helps retain moisture, offers protection around plants, deters slugs and snails and is now available in bulk quantities. This product is exempt from any promotions, discounts and express delivery - deliveries to parts of Scotland, Highlands and Islands will incur additional delivery charge. Strulch Garden Mulch is used by famous sites such as RHS Wisley, Ryton Organic Gardens, The Eden Project and has been featured on BBC Gardeners World at Berryfields. 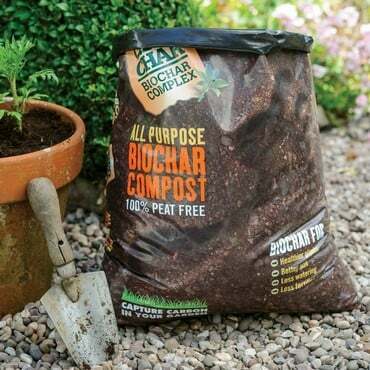 The bulk quantities are available in 2 sizes, giving a huge saving on buying single bags and ideal for larger garden projects. 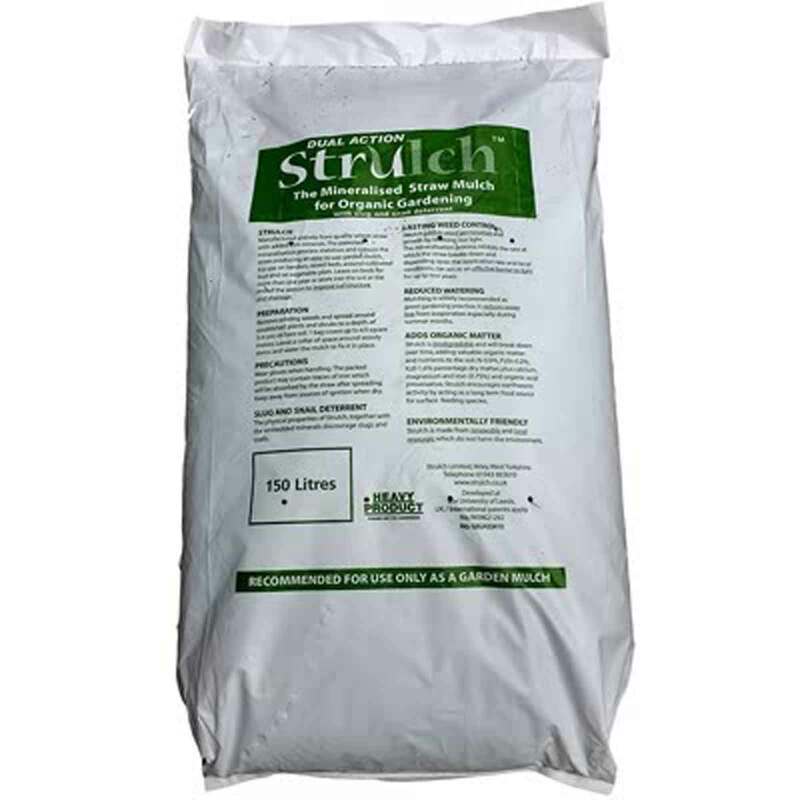 GFE-341 - 25 x 150 Litre Bags - Save £171! GFE-343 - 50 x 150 Litre Bags - Save £458! 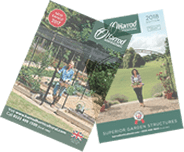 We would like your delivery of Strulch to run as smoothly and safely as possible, therefore please read the delivery information carefully as redeliveries will cause delays and also incur additional charges. Standard deliveries take place between 8am and 5pm weekdays. Standard deliveries are made using a 17 tonne vehicle. Please call if you think access to your property may be difficult. The Pallets need to be set down on a non-gravel hard standing area because the trolley wheels cannot operate on gravel. The trolley can then be pushed a short distance providing there is solid ground and the gradient is not too steep. 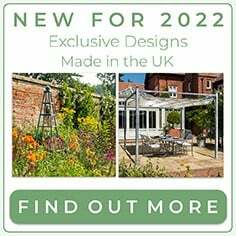 Let us know where to leave the pallet if you are not in when the delivery arrives. If we are unable to leave the goods where instructed a re-delivery charge will be applied. Our delivery agent also requires a telephone number (preferably a mobile number) to ensure they can contact you even when you are away from home. 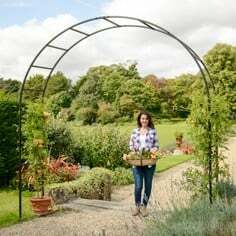 Delivery is £19.95 in England and Wales - for Scotland and Highlands and Islands please contact us on 0333 400 6400 (local rate) for a delivery quote. Please see Help and Advice for a list of post codes that will incur additional delivery cost. 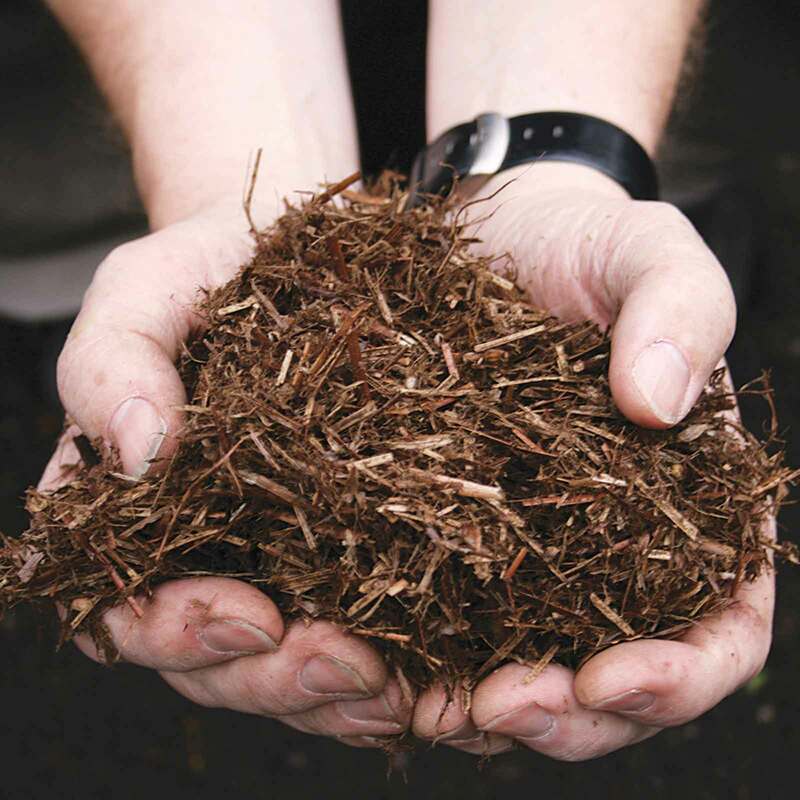 This mineralised straw garden mulch, lasts up to two years, spreading the cost, saving water and fertiliser, making your plants grow healthier and stronger and giving you more time to relax. 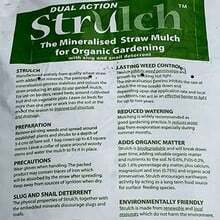 Mulching with Strulch is good gardening practice because it provides a protective covering for the soil, assists in the retention of soil moisture so that nutrients are more easily absorbed by plant roots and also protect roots from heat stress. 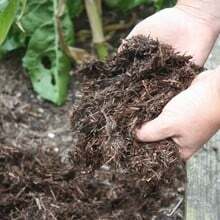 Being biodegradable and will break down over time, adding valuable organic matter and nutrients to enrich your soil, improve drainage and make your plants grow healthily. Encourages earthworm activity by acting as a long term food source for surface feeding species, which makes your soil even better. 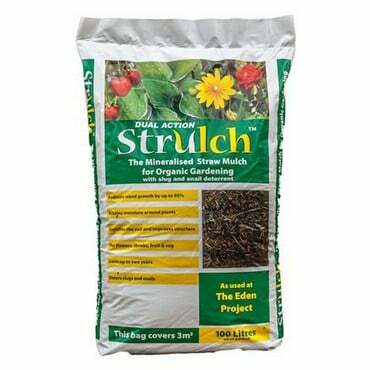 Strulch has been used at the following prestigious gardens and sites RHS Wisley,The Eden Project, Ryton Organic Gardens, Helmsley Walled Garden - the gardens of the Duke and Duchess of Northumberland and The Duke and Duchess of Westminster's estate at Eaton Hall in Cheshire and Strulch has featured regularly at Berryfields on BBC Gardeners World. 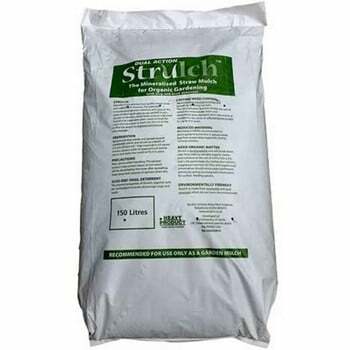 Supplied in 150 litre bags which will cover up to 4.5 square metres. 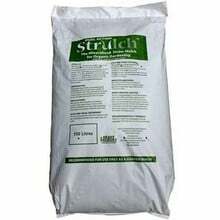 I used Strulch for the first time this Spring. 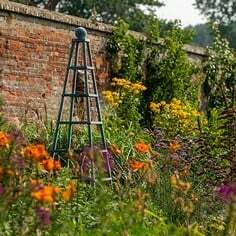 It has certainly helped to keep the weeds down; although some perennial weeds are still coming through it's easier to keep on top of them. I did find that the area covered isn't quite as much as claimed, obviously it depends how deep you need the mulch. 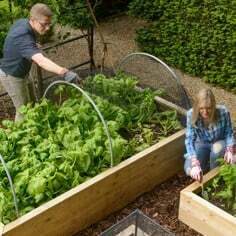 It's been excellent on my raised beds, keeping the soil clear of weeds before planting which has had to be later this year owing to the weather. 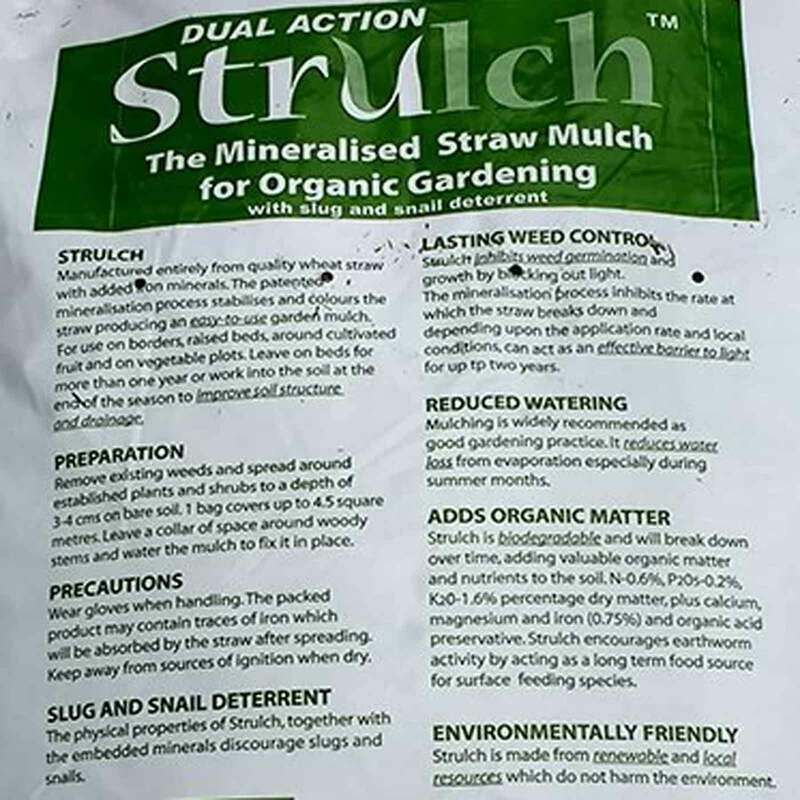 With regard to discouraging slugs and snails this has been less successful - perhaps slugs and snails are particularly greedy in Scotland! They have done quite a bit of damage to my ligularia already so I've put pellets down. 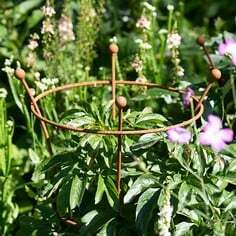 Strulch is very light to move around and it looks very attractive. I would recommend it. Standard deliveries take place between 8am and 5pm weekdays. Standard deliveries are made using a 7½ tonne curtain sided vehicle with a tail lift - the trucks are 6m long and 2.4m wide. Please call if you think access to your property may be difficult. The vehicle will lower the the pallets of Strulch to the ground using an electric lift. Pallets need to be set down on a non-gravel hard standing area because the trolley wheels cannot operate on gravel. The trolley can then be pushed a short distance providing there is solid ground and the gradient is not too steep. 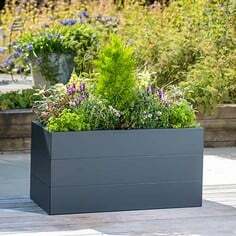 Let us know where to leave the pallet if you are not in when the delivery arrives. 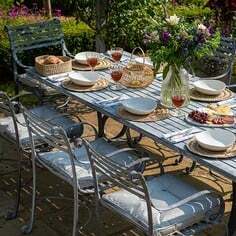 If we are unable to leave the goods where instructed a re-delivery charge will be applied. Our delivery agent also requires a telephone number (preferably a mobile number) to ensure they can contact you even when you are away from home.